Kareem Ferreira is a Hamilton native and McMaster graduate who presently attends Brock University's Teachers College. Kareem's art focuses on the pan and his Caribbean and Afro - Canadian heritage. His involvement in the Hamilton Youth Steel Orchestra, on their 10th anniversary informs this exhibition. 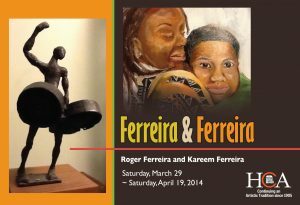 Roger Ferreira was born in Winnipeg, but lived in Trinidad where he began his artist career. Returning to Canada and settling in Hamilton he graduated from McMaster and University of Toronto OISE. Roger's art focuses on education as he explores Hamilton's heritage and brings Caribbean and Trinidad Caribbean heritage to the mainstream.